Grow your own potatoes – no garden needed! You don’t need a huge garden to grow spuds anymore! Some great technology has been applied to make these strong potato growing bags that are perfect for a small garden where you wouldn’t have room to grow rows of potatoes. Charlotte Seed Potato Tubers – delicious warm in salad! Blue Belle Potato Tubers – with a blue patch over the eyes – ideal for baking, roasting or boiling. Lady Christl Seed Potato Tubers producing spuds 8 weeks from planting! Start them off in a frost free place and you could be eating your own home grown potatoes in May! 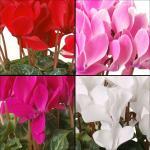 Set of 4 Cyclamen in 11cm Pots – these are really pretty flowers that will flower all through the winter. Set of 5 Oleanders in 14cm Pots – red, pink, white, cream, and yellow colour flowers. Handy Blower & Vacuum for Garden – essential for light work of clearing those leaves! Set of 6 Blueberries in 9cm Pots – grow your own delicious blueberries! Canary Island Date Palm – Canariensis in 5 Litre pot.